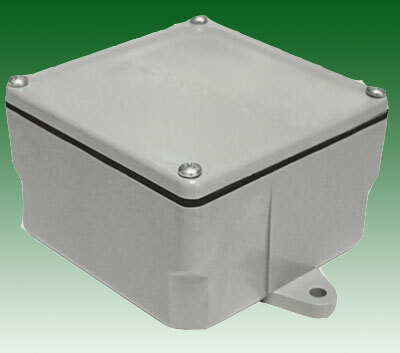 PVC Junction boxes are surface mounted enclosures without entrance hubs which allows multiple conduits to be connected and wire splices to be made within. An appropriate round hole for conduit entrance must be cut. Terminal (male) adapters or junction box adapters may be used to secure conduits to the box. PVC Junction Boxes may be concrete encased or buried but not they are NOT warranted or listed to be watertight for all circumstances. I needed a heavy duty, UVRay resistent box to house the wiring and other electronics for a outside Wireless IP Camera. Camera is mounted onto the box with the wires running through a hole I drilled then sealed to prevent water inside. This box works perfectly for this use. I love G & S Supply! And their customer Service takes my breath away!!! !